Propaganda requires inconvenient truths to be replaced by useful lies. For the purposes of public relations, a bald assertion made often enough is as good as a fact. For the issues covered in this blog, I've characterised this as 'we're public health, we say what we want'. So long as people believe it, that's all that matters. Although it was on the front page of the Beeb's news site, this wasn't much of a story. All that had happened was a Green party councillor had complained about the local council investing in tobacco stock, presumably for its pensions. Mr Essex said it was hypocritical for the council to invest in the tobacco industry. He called for it to "show some leadership and take our money out of an industry that does so much harm and costs the NHS so much". This fellow clearly has a moral objection to certain industries and doesn't want the council associated with them. This kind of virtue signalling is central to the divestment crusade. Fair enough, he has his view, but moral ickiness is not enough to persuade people to sacrifice money for self-righteousness (which is the trade-off required by divestment). His moral indignation is the true motivation, but it is not sufficiently useful to win the argument. "Over the long term, tobacco companies do not provide significantly higher returns than other companies." This - obviously - is the reason councils, universities and pension funds invest in tobacco. They pay good dividends and the share price outperforms that of nearly every other industry. 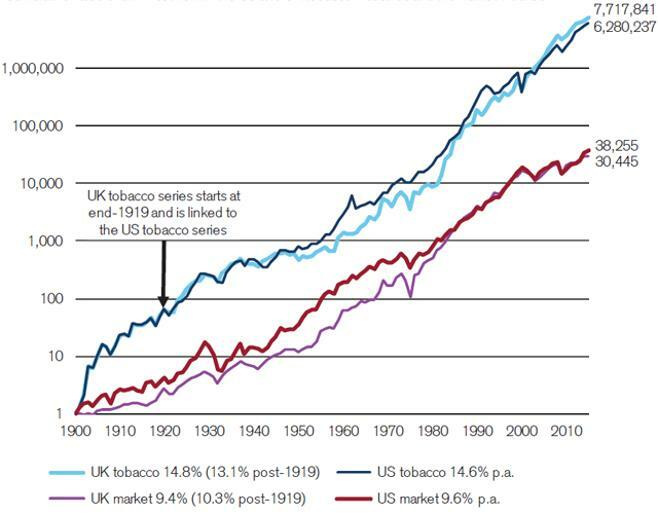 Between 2000 and 2012, for example, British American Tobacco yielded a return of +669%, making it the fifth most profitable FTSE 100 company. BAT, like Imperial and the other big tobacco firms, produce 'above-average yields, and good records and prospects of dividend growth.' They have been 'some of the most reliable income generators for many years'. They are 'cash machines'. If the BBC had approached almost any other financial analyst, this is what they would have said. 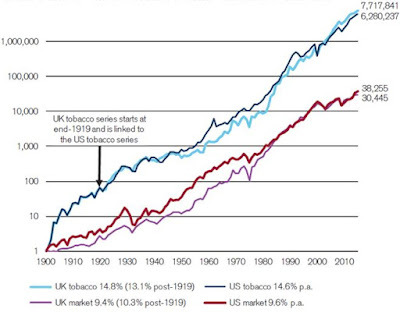 It is, after all, a simple, verifiable fact that tobacco shares have been amongst the best in the world over virtually any time frame you choose to look at it. Instead, they managed to find somebody to say something that was useful but totally untrue.